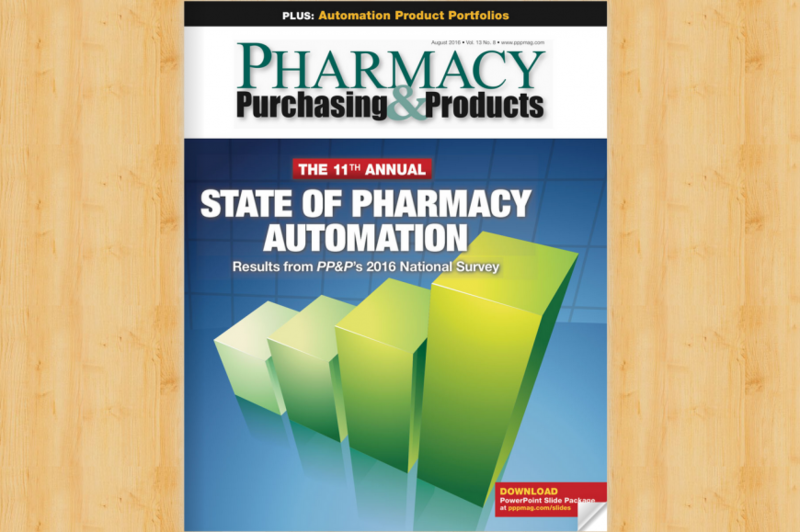 Pharmacy Purchasing & Products has released its 11th Annual State of Pharmacy Automation issue revealing the results of their national survey of health system pharmacists. This year, responses were received by 384 Pharmacy Directors. As health system pharmacists work to expand the utility and efficiency of their operations, Intelliguard®RFID Solutions feature noticeably in several growing and trending categories, including medication tray management (a new category in the survey for 2016), medication tracking systems, medication refrigeration and temperature monitoring and soon to be released, RFID-enabled drug distribution in the OR. 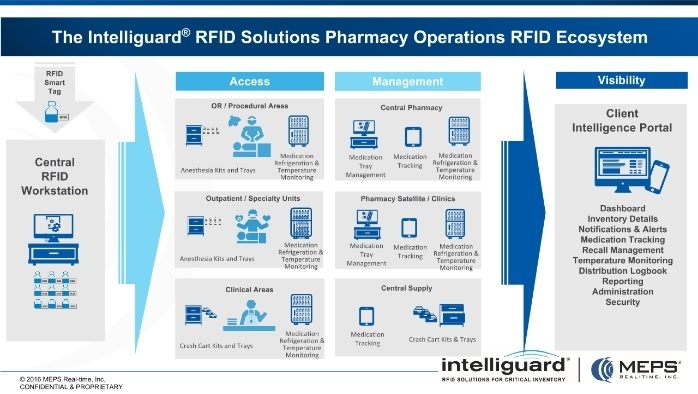 Below is a quick snapshot of the Intelliguard® RFID Solutions Pharmacy Operations Ecosystem. Medical grade refrigeration is a known key component to ensure product safety and efficacy, and investment in these units is expected to continue to grow over the next 3 years. Almost three-quarters of hospitals use these units exclusively in the pharmacy, while use on clinical units is significantly more sporadic. Of course, vaccines are only one category of temperature-sensitive medication. Many other medications and clinical trial investigation products have recommended storage at either controlled room temperature (20-25° Celsius) or cold (2-8° Celsius) temperature and must be kept within their temperature range at all times to prevent spoilage. If epinephrine is exposed to repetitive heating and cooling, it can lose 64% of its efficacy. If a compromised dose of epinephrine is used to treat a patient suffering from a serious anaphylactic reaction, it may not work as intended, resulting in possible death. Do not store any vaccine in a dormitory-style or bar-style combined refrigerator/ freezer unit under any circumstances. Even so, the survey unfortunately confirms that in many instances, medications are still stored in dorm-style refrigerators. In addition to proper refrigeration equipment, consistent and accurate temperature monitoring is noted as an operational necessity, yet 17% of facilities have yet to automate temperature monitoring. While specific vendors in use are not called out in the Survey, the Intelliguard®Controlled Temperature Inventory Management System offers a solution that combines medical-grade refrigeration, built in temperature monitoring and RFID-enabled inventory management in one convenient and cost-effective solution. The Intelliguard® Controlled Temperature Cabinets are available to ensure both Cold Storage (2 to 8° Celsius) and Controlled Room Temperature Storage (20 to 25° Celsius). As more and more health system pharmacies look to optimize inventory safety, protect drug efficacy and enable safe, controlled remote access closer to the point of care; and as innovative drug manufacturers and distributors work to enable safe and efficient inventory consignment programs to hospitals across the country, we continue to enjoy increasing adoption and interest in our controlled temperature inventory management solutions. The Intelliguard® Kit and Tray Management System appears in both medication tray management and medication tracking system categories as one of the top vendor systems in use. Automated Tray Management solutions are relatively new and adoption is projected to grow over the next few years. Although the technology is in use in only about 15% of U.S. hospital pharmacies overall, satisfaction rates are high, with 93% rating their vendor as good or excellent. Medication Tracking Systems are called out as a separate category in the survey, noted as “the ability to track and locate a certain medication within the hospital”, although it’s unclear how respondents were asked to differentiate Automated Tray Management from Medication Tracking Systems. Fourteen percent (14%) of respondents noted implementation of dedicated systems to automate medication tracking, and this feature is one of the primary benefits of the Intelliguard® Kit and Tray Management System. ADCs continue to be one of the most important technologies in health system pharmacies, with the survey confirming over 90% of respondents reporting ADC usage. However, technology to enable drug distribution in the OR lags behind that with only 40% of respondents reporting usage of specialized anesthesia cabinets. From our own research, even those that report usage of specialized anesthesia cabinets suffer from low utilization and poor satisfaction from anesthesia care teams. The reasons for such low usage of specialized anesthesia cabinets are varied, but the most prominent reason is anesthesiologists’ reluctance to anything that disrupts their clinical workflow and potentially compromises immediate access to life-saving drugs in the operating room. 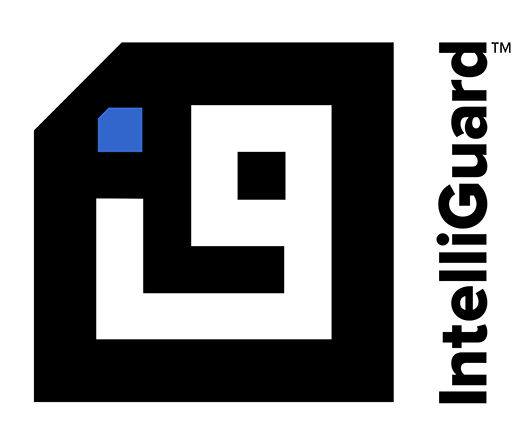 Intelliguard® RFID Solutions will soon be launching an RFID-enabled inventory optimization solution poised to revolutionize the management of drug distribution in the OR. The Intelliguard® Linked Visibility Inventory Station is designed with anesthesia workflows in mind. Using RFID, the Intelliguard® RFID solution completely eliminates disruption to clinical workflows – anesthesiologists simply open the drawer(s), remove the medication needed from an open matrix tray, and close the drawer. All inventory utilization is documented in real-time. Stay tuned for this exciting new product unveiling at ANESTHESIOLOGY 2016 or contact the Intelliguard® RFID Product Management Team Director, Paula Dycaico, at pdycaico@intelliguardrfid.com to nominate your hospital as an alpha partner candidate or see if you qualify for limited release early adopter pricing. Read the full 11th Annual State of Pharmacy Automation Survey and let us know where automation fits into your pharmacy. Click to Get the Facts! Learn how RFID Solutions can help your hospital facility.